The nature of the priesthood of the laity has caused a lot of confusion in the post-Second Vatican Council Church, and so it is important to clarify both the beauty of this doctrine and the difference between this priesthood and the ministerial priesthood. The priesthood of the laity is based on the fact that all those baptized receive not only sanctifying grace, but also a character, or indelible mark, in their souls by which they are conformed to Christ as priest, prophet and king. Vatican II reminded Catholics that all the faithful are truly priests through baptism, but their priesthood differs from the ministerial priesthood in its essence “and not only in degree” (Dogmatic Constitution on the Church, Lumen Gentium, No. 10). Yet, “the one is ordered to the other” (Catechism of the Catholic Church, No. 1547). The ministerial priesthood, though it involves the power to define doctrine on the episcopal level, to govern the earthly Church and to consecrate the Eucharist, is only a means to the end of the holiness and consecration of all the faithful. The clergy are the means ordered to the end, which is the faithful. Vatican II was very clear that the laity constitute a true state of life in the Church as their consecration is more general than priests and religious and oriented to the secular world. However, this recognition of a lay state is to be understood as referring to that state in a broad sense of the term. As the council fathers wrote, “The state of the laity is used in place of condition and mission (terms which occur a little further on) so that the honor of constituting a state is recognized for the laity at least in the broad sense” (“Doctrinal Commission on Lumen Gentium”). Lumen Gentium’s definition of the laity looks at the lay faithful primarily as distinct from the rest of the Church, but the late Dominican priest and theologian Jordan Aumann, in his book “On the Front Lines” (Alba House, 1990), developed a more positive definition of the laity, one which seeks not just to set the laity off in relief from those with a special consecrated role in the Church, but also to identify their consecration. To summarize his points: the laity, like all other members of Christ’s faithful, are baptized persons (sacramental aspect) who are thereby incorporated into Christ (Christian aspect) and made members of the Church (ecclesiological aspect) with the right and duty to participate actively in the mission of the Church (missionary aspect). In addition to all that, the laity, by reason of their secular characteristic, are committed to the renewal and sanctification of the temporal order. The laity have a place in the Church which is characterized as “mission.” They are distinguished from both the clergy and religious because their true consecration in the Church is of a secular nature. The “world” here is taken not only to mean the world as a kingdom ruled by sin, but also, in a more positive sense, everyday life. The laity are called and gifted to sanctify the world from within. Meanwhile, the sacred ministry of the sacraments and the separation from secular occupations and interests are part of the nature and mission of the clergy and religious. As the laity are to sanctify the world from within, it would be equally a mistake for clergy to become what Father Aumann called “hyphenated priests” occupied mostly in secular pursuits, or for laypeople to be clericalized so they take over all functions in the liturgy and the parish except actual consecration of the Eucharist. The laity are not, therefore, some stand-alone vocation in the Church. They are truly called to sanctity, along with priests and religious, albeit in different ways. They truly serve with the bishops and priests as brothers (see Lumen Gentium, No. 10). This mission includes the threefold nature of the mission of Christ: priest, prophet and king. The teachings of Vatican II clarify this by holding it should not involve too rigid an application of this threefold mission, lest a tripartite theology be applied. Rather, the use of these terms means, more generally, worship (priest), witness (prophet) and service (king). The priestly aspect of the laity is seen not in offering the sacrifice of the Mass by changing the bread and wine into the body and blood of Christ. Laity are not in themselves ministers of the altar. Instead, it is seen in all the actions of their everyday life when viewed from God’s point of view. These actions are most fittingly offered with the victim in the sacrifice of the Mass. And so, Lumen Gentium teaches, “worshipping everywhere by their holy actions, the laity consecrate the world itself to God” (Catechism, No. 901). The consecration of the world through the actions of the laity is not due to the actions themselves, but rather to the attitude of the one who does them. This attitude is looking at the world from God’s point of view, under the aspect of eternity. At Mass, the laity truly offer what they are with the priest and receive the gift of Christ to transform their way of thinking and action to be that of Christ. The prophetic aspect of the mission of the laity by which they witness to the truth includes their witness to the last things. Until the end of time, God fulfills the prophetic aspect of Christ’s mission not only in the formal teaching of the hierarchy, but also in the witness of the laity who teach the Faith. Central to this prophetic ministry is the instruction in the Faith which parents should give their children. This adds to the priestly role of the laity in marriage. 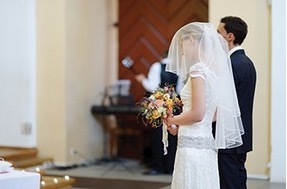 The Church has reiterated a long-standing teaching that marriage is itself holy because the ministers are the baptized couple, made holy by baptism. In the exchange of vows, baptized couples are the means of holiness for each other, so they truly are the ministers. The priest and the Church must be present as witnesses because it would be unfitting for Christians to exchange vows of love in any other context than that of Christ and the Church. The union of the couple is not merely religious, but supernaturally holy, because of the character of baptism present in the parties. Marriage is thus the prime exercise of the priesthood of the faithful, which was common to all the baptized. This divine character of human seed can only be finally completed in the Vision of God, when man sees God face-to-face. Parents are the primary ministers who prepare their children for this mystery. Education does not end at Harvard or Yale, but in heaven. The child must be schooled for the cultus Dei, the worship of God. This schooling is an education in the virtues. This makes the home a domestic Church. St. John Paul II, in his famed apostolic exhortation on the role of the Christian family in the modern world, Familiaris Consortio, explains, “The Christian family constitutes a specific revelation and realization of ecclesial communion, and for that reason can and should be called a domestic church” (Catechism, No. 2204). The kingly role is expressed in Christian service, especially in the virtue of justice. One must realize that the power to rule is expressed first in ruling oneself and one’s own inclinations to sin with the help of God’s grace. St. Hilary wrote: “There are kings in whom sin does not reign, who rule their own body…. These are kings and their king is God.” This is accomplished through the self-surrender to God brought about by the rule of the virtues and the gifts. The laity are called to bring forth the kingdom of Christ, first through the interior self-rule by which they can be a leaven in the secular professions. From this interior integrity they can seek to establish justice and mercy in secular life. In a very real sense, then, the laity are priests, but by an essential difference in the participation in the character of baptism from ministerial priests. The consecration of the Eucharist and the forgiveness of sins together with leadership in the parish and true teaching are all meant to nourish the priesthood of the laity. Father Brian Thomas Becket Mullady, O.P. is an author, retreat master and preacher. Can the Laity Distribute Communion to the Homebound? Comments Off on Can the Laity Distribute Communion to the Homebound? One practical result of expanding the Church’s Eucharistic ministry to include the laity is increased service. A well-organized lay ministry can bring the Eucharist to the ill and homebound far more often than an unaided pastor.